Cut foie gras into 1/2-inch pieces and season with salt and pepper. Place non-stick skillet over medium-high heat; drizzle in canola oil. Saute foie gras, a few pieces at a time, taking care not to overcrowd the pan, until golden brown on outside and pink on inside. Transfer to paper towel-lined baking tray, and repeat with remaining foie. Carefully wipe out pan with paper towel and return to medium-high heat; drizzle in olive oil. Add garlic and shallot; saute until just beginning to color and soften. Deglaze with balsamic; reduce to glaze. Stir in port; reduce to glaze. Whisk in butter; season to taste with salt & pepper. 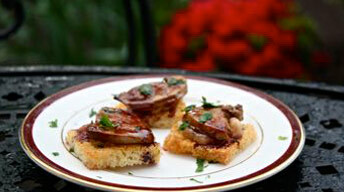 Top brioche toasts with foie gras and drizzle port reduction over the top.